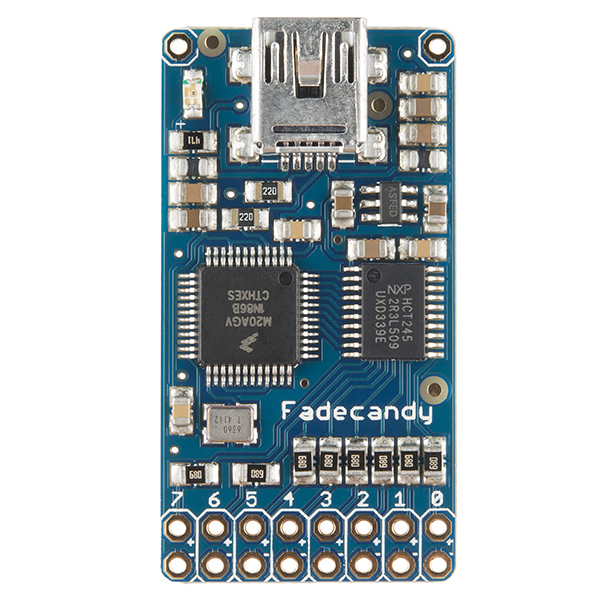 This is the FadeCandy from Adafruit, a USB controlled LED driver with on-board dithering to help illuminate your NeoPixel project. Even though the FadeCandy was designed to be used alongside of the NeoPixel Line the driver also works with most WS2811/12 LEDs. 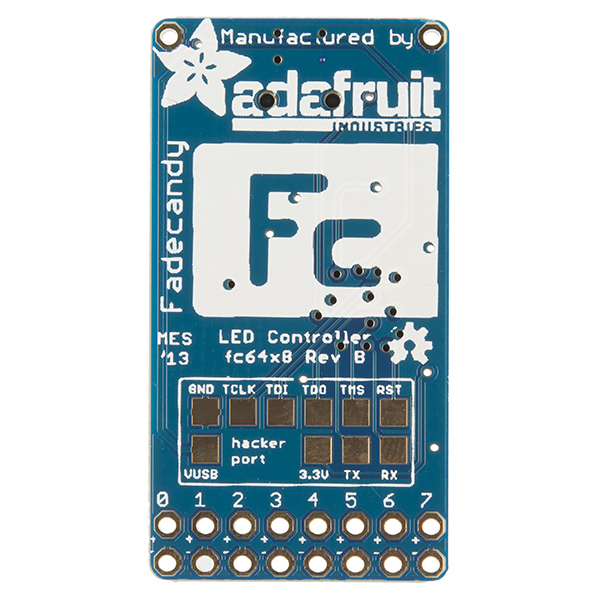 This little board has been designed to help both beginners and the advanced LED techie! Eight outputs line the bottom of the FadeCandy to provide you with a way to support up to 512 LEDs total assigned to each output in eight strips of 64 LEDs each. Thanks to the firmware each driver utilizes a unique built in dithering algorithm to help in color correction to make the light from each WS2812 apear and move and fade smoothly. 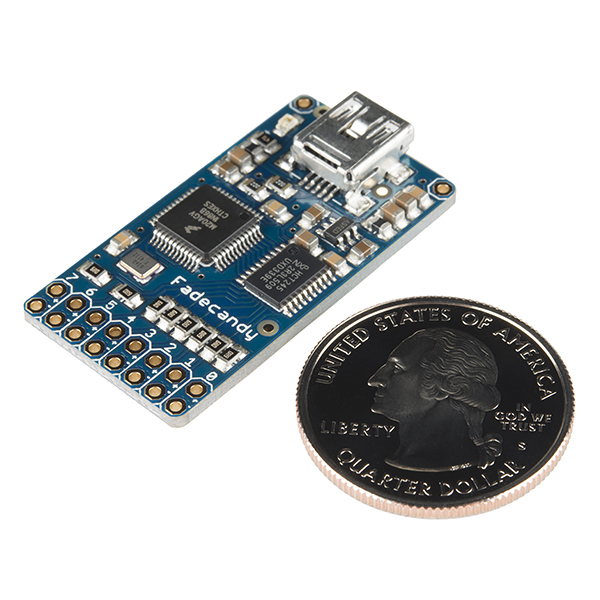 Can you program the FadeCandy, and have it run stand alone, or does it always need to be connected to a computer/rasberry pi for it to work? This looks like a Teensy 3.1 microcontroller with a 74HCT245 used as a DC-DC converter. This is very similar to where I got to when trying to use a Teensy to run 130 LEDs, except this probably works better than my hack. The AAT3110 is a ChargePump that can give you 100mA of regulated 5V from a 2.7 to 5V input. It's used to supply the 74HCT245 which give you a nice clean translation from the 3.3V output of the microcontroller to the 5.0V that the LEDs want to see. This should make it a lot easier to use the WS2812 LEDs, which can be very finicky, especially when you're running a lot of them at the same time. I'll have to try it out. I'd just like to comment that I think this board is totally magical and have used it to make amazing effects with LEDs (WS2812 strips powered by RPi) that I likely wouldn't have attempted nor achieved such a great effect with without Fadecandy. It's pretty great, and I think having one of these will totally transform an artist's ability to create beautiful visuals with LEDs. I see nothing wrong at all? It gives technical details and an overall description of the product. I think the intended "more information" part is under their tutorial links included at the bottom of the description. Which part seems incorrect to you? Seems like the proper description to me. The description does NOTHING to describe what the product actually does or how it works, as demonstrated by the other confused comments here. 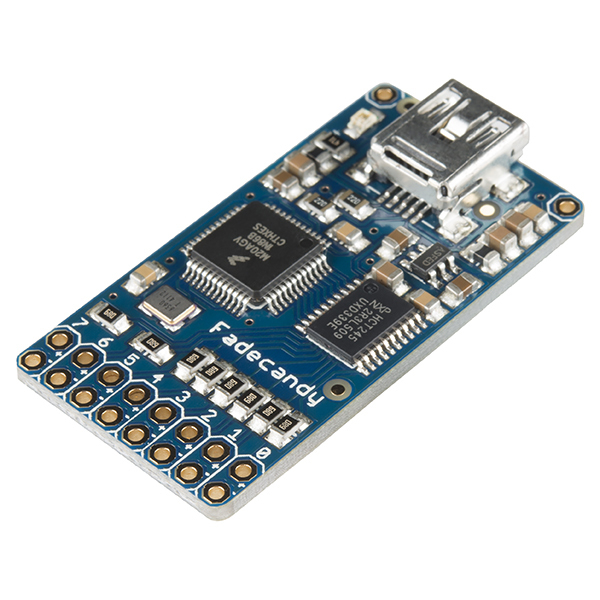 The most important part of this product is the amazing combination of software available, including the Fadecandy Server software, which runs on multiple OS's and can communicate with one or many Fadecandy boards. It's also compatible with the Open Pixel Control protocol, which provides endless possibilities. Sorry, but this feels like a really lazy attempt at adding a new product by someone who really doesn't care. You went to the effort of properly describing the product in your new product video, but that's not linked on this page, nor have you provided links or information to all the relevant software. Very disappointing effort on your behalf.